So You Have a Foot Orthotic Prescription? You go to the doctor for foot, ankle, or knee pain and he gives you a custom foot orthotic prescription. What is the next step? Give us a call! Bioworks accepts most health insurance plans and some insurances cover foot orthotics. We can help start you on the road to recovery. Foot orthotics do require at least two appointments with one of our certified orthotists or pedorthists. If your physician prescribes you custom foot orthotics, it is a two-step process. First you come in for a no cost evaluation. Our orthotist or pedorthist will evaluate your feet, watch you walk, and discuss the goals you would like to achieve. At this appointment, we will also discuss insurance; there are certain insurances we know will not cover orthotics (Humana and Medicare), but do not fret we do offer orthotics at a discounted rate. We bill insurance between $400 and $450 depending on the orthotic received. We also allow for patients to go on payment plans; it’s never a set payment, just what you feel comfortable paying that month. 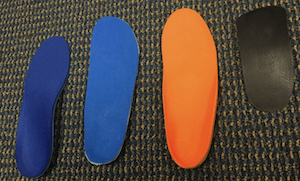 Once you have your evaluation you do not have to have the orthotics fabricated; we can check your benefits, call you with the information, and then you can decide. If it is not the right time for you to get them or if you just don’t think orthotics will work for you, there is no charge for anything. We only bill insurance or you, if a product is received. The information we obtain from your evaluation is good for 3 months before you would have to come in for another evaluation. If you would like us to bill insurance we will need a prescription from your physician. Fitting usually takes place between 1 or 2 weeks of the evaluation, depending the orthotics fabricated. We ask that you bring the shoes that you wear the most. We will take those shoes into our lab and grind the length of the orthotic to fit inside. Next, we will have you walk and make sure they feel comfortable. If there is something that is uncomfortable, we can fix it right then and there. Once you are fitted for the orthotics, we suggest weaning onto wearing them all day. This may take a couple weeks, it could take a couple days. Depending on your activity level, your orthotic may wear down and feel different than when you were initially fit. We offer free adjustments for the life of your orthotics. If you are wearing them and something doesn’t feel right or you are getting blisters, give us a call and we will gladly set you up with an appointment for an adjustment. Most orthotics should last 2-3 years, depending on your activity level. If your top cover has worn away and it has been less than a year, we will replace for free; if it has been over a year it is a $25 self-pay charge. Walking around with foot, ankle, and knee pain is never fun. Let us help you gain a pain free lifestyle. Give us a call at (513)793-7335 or fill out our appointment request online and we can get started today! You can request a foot orthotics appointment if you have a prescription from your doctor. When you can’t get orthotic shoes from a specialist, you can use these tests and choose the best shoes to support your feet and provide the best support for your knees, your back, and your posture. Heel Test – Hold the shoe in both hands; place one hand on the bottom of the front of the shoe. Push the heel of the shoe toward the inside of the shoe with the other hand. If the heel is easy to push down it won’t provide good support for your heel. The best shoes have a sturdy heel to support the entire foot and ankle. Toe Test – Hold the shoe in both hands; place one hand at the toe of the shoe and one and on the heel of the shoe. Push the toe of the shoe up to try to bend the front of the shoe up. If the shoe is easy to bend anywhere but where the toes meet the foot, it will not provide good support. 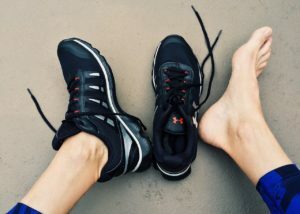 The best shoe will have very little bend anywhere but right where the toes connect to the rest of the foot. Twist Test – Hold the shoe in both hands with one hand gripping the heel and one hand gripping the bottom of the front of the shoe. Twist the heel to the right while twisting the front of the shoe to the left. The best shoe will be difficult to twist. If the shoe is easy to twist it will not provide good support. The next time you go shoe shopping, take these tests with you to choose the best shoes. These tests will help you find shoes that will reduce foot and knee pain caused by wearing non-supportive shoes. If you have any questions about choosing the best shoes you can send an email to contact@gobioworks.com.